Mordecai Historic Park has its Haunted Mordecai Free Festival this Saturday, 10/26 from 5p-10p. In addition to games, crafts, food, etc., there will be a “paranormal investigation group” presenting what they found out about Mordecai’s ghosts, and also costume contests for different age groups (under 3 at 6pm, 4-6 yrs at 7pm, 7-12 at 8pm, 13-16 yrs at 9pm). To do the Lantern Tour of of the Mordecai House, you need tickets. 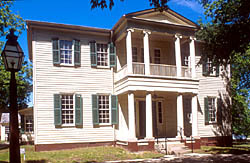 Mordecai Historic Park is just North of Downtown at 1 Mimosa St.